Blurb: Tara Bakshi, a young lawyer with a difficult boss. No matter how hard she works, how many all-nighters she pulls, he is never satisfied. When she starts work on the top-secret assignment, project Emerald, Tara discovers that someone has been tampering with the files and her boss asks her to find the culprit. 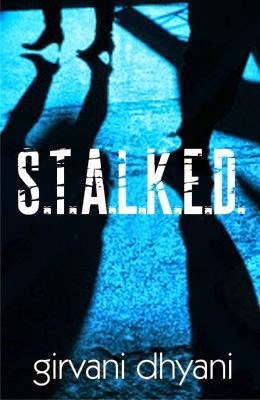 As time ticks and Tara uncovers one evidence after another, someone starts stalking her every move. He shadows her on the street, in the parking lot, in her own bedroom; nowhere is she safe from his prying gaze. The only clue she has to his identity is a Zippo lighter with a serpent carved on it. Verdict: The cover design by Riti Jain Dhar and the title by the authoress gave the book its much needed feel. A cover like this would surely stand out from the crowd of the love stories that the bookshelves are full out. The blurb also gives a very mysterious feel which would make the readers grab the book at one go and read it at once. The first scene of the story give the book its much needed feel and increases the readers’ urge to read and know what the book has in store for them. Greeted with a very familiar setting of regular life of strict boss over meek and working employees gives the readers a very real to life feel making them love the book all the more. Apart from that, the storyline was also fresh giving the readers a very unputdownable feeling while reading it. The narrating style used in the book was really interesting with different chapters in a different voice and of a different perspective resulted in the readers loving the book at every angle. The way the story has progressed from the clues left behind, Tara’s doubt and finally the end to it leaves the readers mesmerized throughout the book. The author has done a very nice job in writing this whole book. I really loved the whole part ‘snakes’ has played in the book which gives the book a very eerie feeling. And I am sure to say that the eerie feeling stays with you for a very long time even after reading the book. After finishing the book also, the hang of the book stays and if you want to go and walk on the road at that moment, you are sure to get ‘spooked’. Such, is the charm of the book and the narrating of the authoress. But, to an extent, I felt that a few parts of the book were very ‘tough’ to be a part of reality and that’s when the readers might not connect to the book. Even though the authoress has done a good job with the book still I felt that if written in a better way with more mystery and thrill would’ve taken this book to an all new level. Apart from those few flaws of the book, for me it has been a very nice one-time read and I would surely recommend the same to my readers and urge them to go and pick up the book. Final Words: A very nicely written book, a very new age thriller. Girvani Dhyani does her best with the thrill down the spine read for the readers!